JVC HA-ETR40 review | What Hi-Fi? 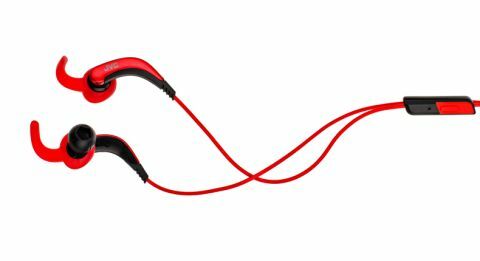 No matter the price, sport headphones need to do two things: fit securely and comfortably, and sound decent. These JVCs get it in one. Despite being just £35, they are the flagship model in the company’s new in-ear sport range, and fully committed to the fitness cause. They aren’t just water-resistant, but washable to IPX7 standards, so you can give them a thorough clean under the tap after use. Be careful soaking the only-splashproof 1-button remote, though – you’ll need that working for hands-free playback and call functions. A small gel-hook protruding from the bud achieves a reliable, secure fit; soft and unobtrusive, it does a fine job nuzzling into your ear and can rotate around the bud for more flexible positioning. In addition to the three sizes of in-ear tips in the box, the JVC earphones come with a pair of ‘open type’ ear plugs, which are designed to let ambient noise in through the tiny holes that permeate around them. The difference between them and normal tips is apparent, though doesn’t make you as aware of traffic as the Monster iSport Strive headphones. It’s a shame there’s no travel case supplied for extra protection in your gym bag, but the accessories don’t stop there. An extension lead doubles the 0.6m cable so it can reach into a trouser or shorts pocket, although the shorter length is handy for those who strap their device to their arm and don’t want lots of spare lead dangling around. The choice is welcome. Move onto sound and the JVCs only get better. Cheap headphones often suffer from thinness and brightness. Not here. The JVCs have decent weight – a touch more than the Audio Technica ATH-CKP2000 earphones – and are beautifully balanced. For their nominal asking price, they offer quite a lot. You can often forgive a lack of bass depth at this price, too, but you don’t have to do that either. The bassline in Michael Jackson’s Another Part of Me has punch and reasonable extension. Stick with the song and vocals are well projected and conveyed with decent levels of transparency. They snap into ‘drama’ mode as the theatrical string piece in Daft Punk’s Beyond bursts into being, and duly keeps up with the fast rhythms that follow. The JVC HA-ETR40 in-ears aren’t baffled by the track’s complex composition, either: instruments and electronic effects are precisely placed, and the subtler strumming of acoustic guitars beneath the wrath of funky synth sounds pulls through with ease. They don’t have the full dose of insight or subtelty, but their presentation is one you could happily listen to for hours on end – and the comfort won’t get in the way of doing just that. Looking for affordable in-ears for those gnarly gym sessions? Here’s a pair with your name on it.